Hi! My name is Veronica. Right now, my life is a chaotic mess... My summer hasn’t been tanning at the beach or going to ballgames every week, like I had planned. Mother is sick, so I’m back home to take care of her, and it’s a full time job. We were never very close, and disagree on everything. Thank goodness my aunt helps out so I can escape to the local coffee shop. Maybe it’s the hot coffee, or the even hotter dark-haired man that comes in each night to clean the shop, but it helps me relax at the end of a long day with Mother. I work on my dream of writing a novel while I sit there, but I’m more distracted by Enrique and his Spanish flirtations. A love of coffee and baseball brought us together, but I’m not sure if it’s enough when I have so many secrets to keep. **** Author’s Note: This is a full length novel with steamy romance scenes and a happily ever after. This book contains sexual content and language. 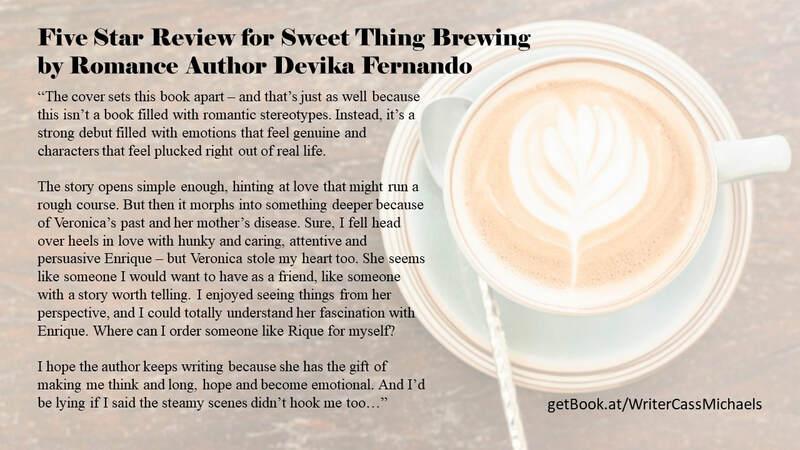 To find out more, get your copy of Sweet Thing Brewing!